I spent the holidays with my family in Las Vegas. My brother Max is the author of the often mentioned Fruity Chicken. It’s his blog about raising chickens and fruit trees in Las Vegas. 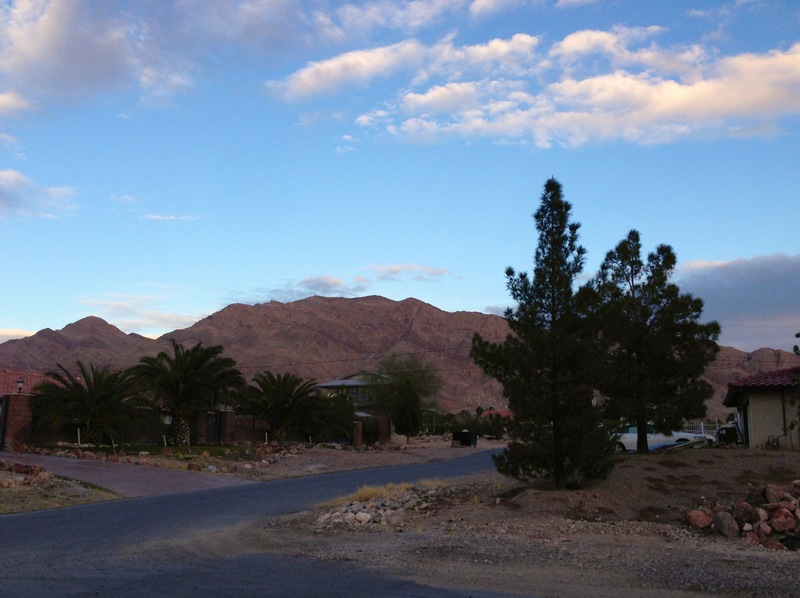 The virtual Fruity Chicken is located on WordPress, but the real one is located at the base of Sunrise Mountain on the outskirts of town. I thought I would use a post to show you around the nearly famous grounds. The photo above is the view from the house on the lot adjacent to the chicken pen. The truth is that the Fruity Chicken rests on an acre packed with potential and a house in the midst of a massive remodel. My first day in town Max offered to show me around the new digs. Of course I brought my camera. I have spent the last year shooting wild birds to improve my ability to make quick decisions with my camera – to get better at catching the shot. A walk around the back of the lot put my practice to the test – I’m accustomed to shooting from my porch, here I was out in the open when I spotted some movement in the oleanders. The bars on the wings reminded me of a jay, but the coloring was all wrong, it was a vireo – only in town on its way to Mexico on its annual migration. He decided to some out of the oleanders and look me over. 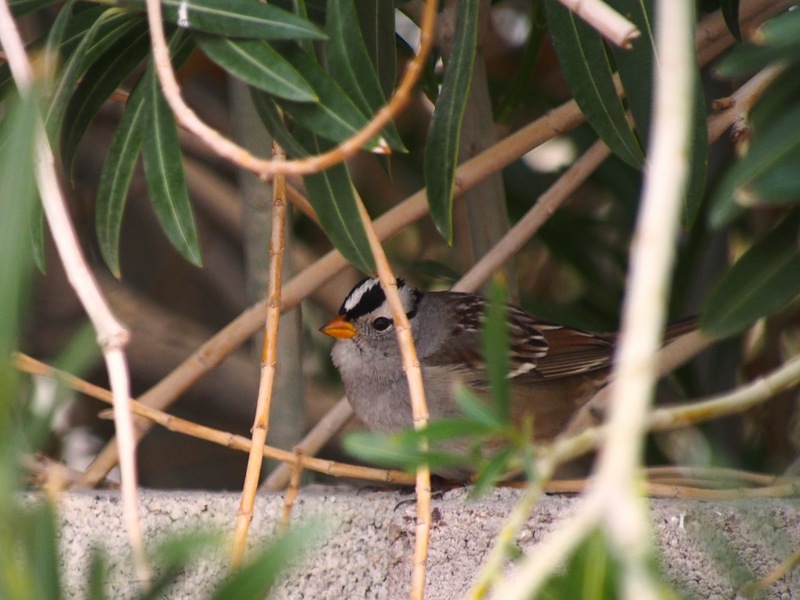 Back in the oleanders I spotted some movement and caught a couple of white crowned sparrows. We made our way over towards the chicken run when we came across some sentries – the roof pack – Oddy and Michone. They permitted us to pass. The Fruity Chicken is filled with lots of types of chickens. I’m fascinated with their eyes. I have no clue what kind these are, but I liked the looks they gave me. 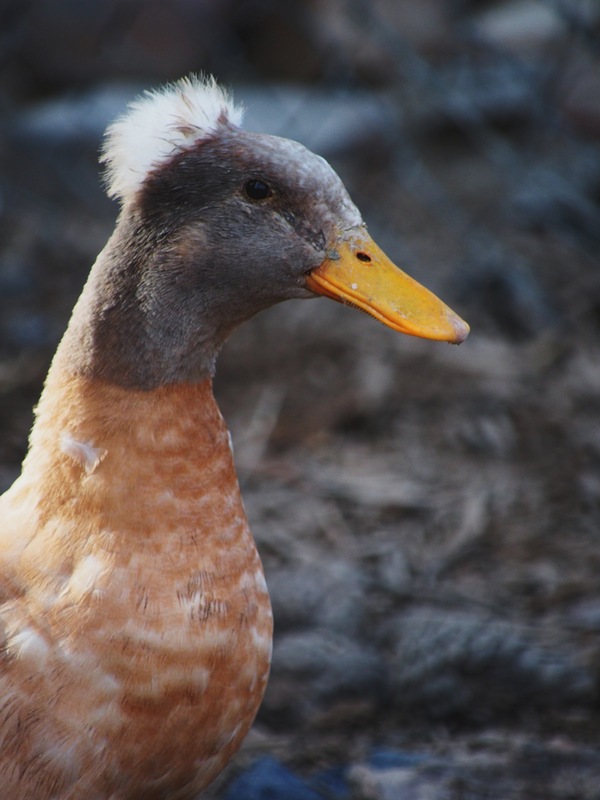 The Fruity Chicken has a few non-chicken residents as well – there are a small group of ducks as well – some with mohawks like this girl. 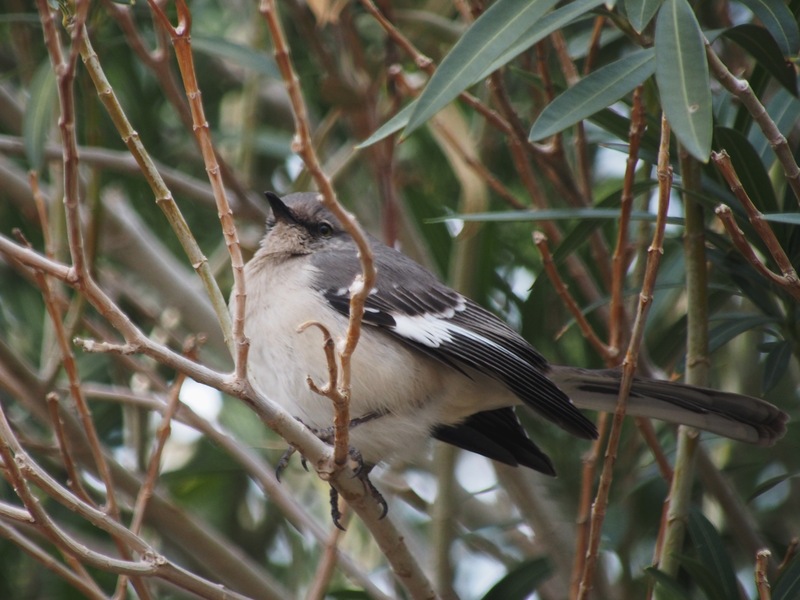 I probably should have taken shots if the orchards or the houses, but I only have eyes for the birds. 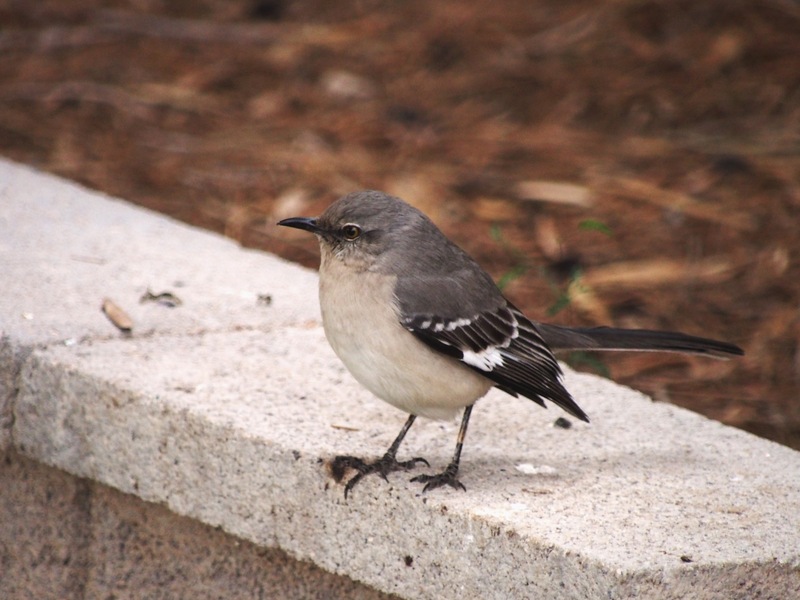 This entry was posted in birds, Photography, Travel and tagged birding, Chickens, Las Vegas, Olympus, Olympus E-M5, Orchards, photography by artsifrtsy. Bookmark the permalink. 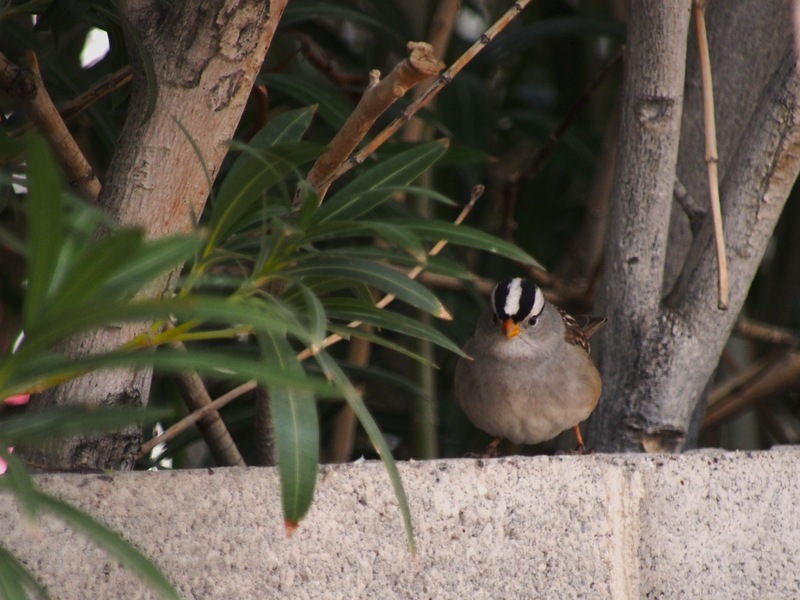 Thanks – that’s a crowned sparrow, such a pretty little bird. Oops. 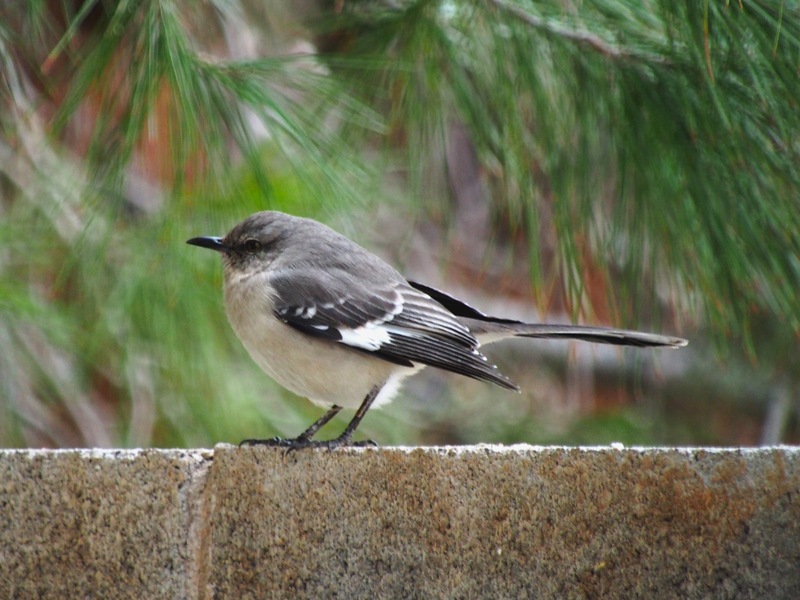 The western birds are so very different. I’ve been home sick for several days, enjoying the show our birds have been putting on. 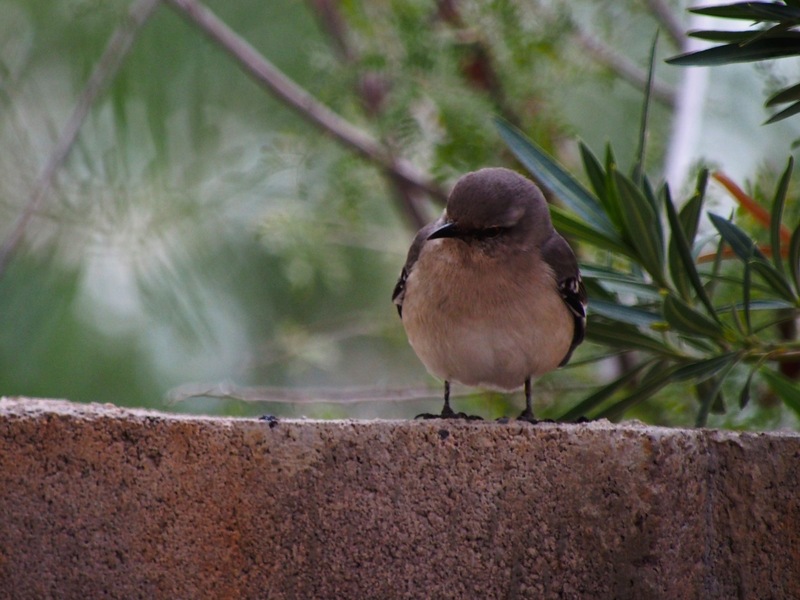 Cardinals, wrens, titmice, nuthatchers. No wood peckers though. Sigh, I have to go back in to the office tomorrow. Feel better soon! I was home sick last week. It seems the birds have kicked it up a notch with the cooler temps – a feeding frenzy. Here too — but it’s warming up. For about an hour today they were going completely crazy. We have window feeders and thought they were going through the glass. None did, though. I spent the weekend shooting – they emptied all my feeders in about 4 hours. Wow! Those are fabulous pictures! REALLY!!! Such fun, and personality. And I think birds are so hard to take! Love the dogs on the roof picture. Thanks so much Marsha. – I really appreciate the kind words and the recognition. I am awful at the awards stuff – I need to do a post about them soon 🙂 Thanks for being part of my blogosphere too! LOL – It is Vegas after all – they should be in rhinestones:) I am glad to be finally coming out of the fog. Those dogs crack me up. Their first response to intruders is to climb up on the roof. I would have to go get my big one down…well…probably BOTH of them. I love metal roofs! What color? I’m betting it is awesome! It’s a vast improvement over the three rotten roofs that were up there when I bought the place! Great photos, as always. I love that those sparrows are so interesting, the ones I see here in the city are all a brownish gray color. 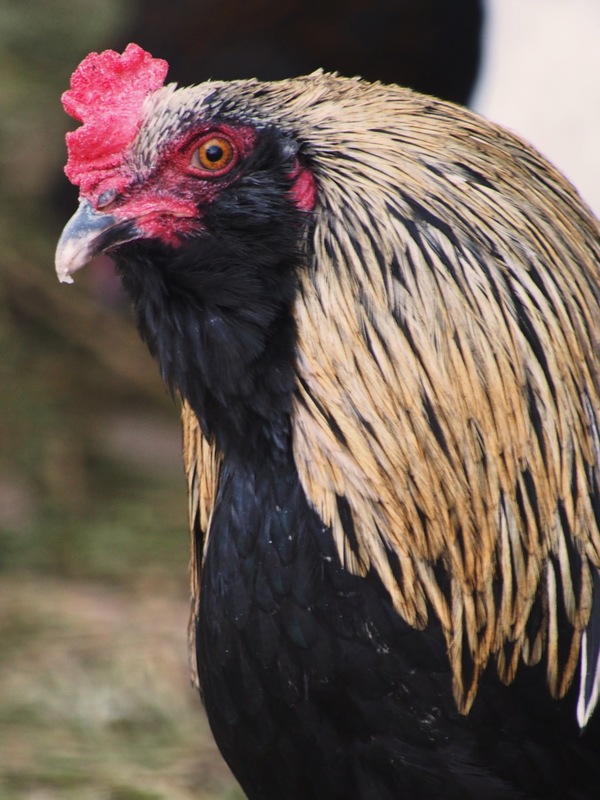 And I definitely never knew chickens could be pretty! Thanks – I have never seen sparrows like that here either. Max would love that you think his chickens are pretty. I love their eyes. Lovely pics of the birds. I also loved the up-close shots of the chickens “eyeing” you. Awesome pictures, love the dogs on the roof too! I wanted to tell you that I finally saw Cardinals again when I went to Montreal this Christmas. They were so pretty! 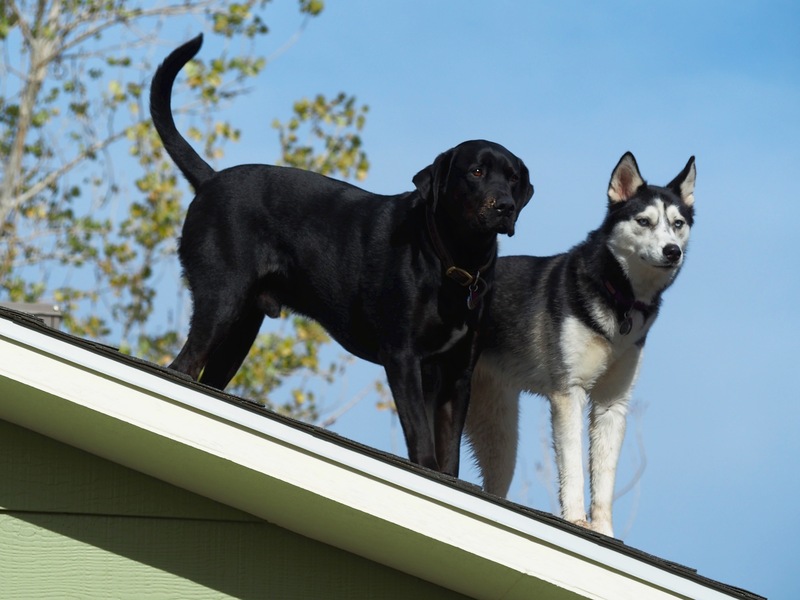 Thanks Dianne, my dogs couldn’t handle being on a roof – those two are so agile. I guess you are just too far west for cardinals at home – they don’t seem to be west of the plains. I saw a few yesterday, so pretty but so elusive. Your brother’s place looks awesome! What does he do with the chickens? 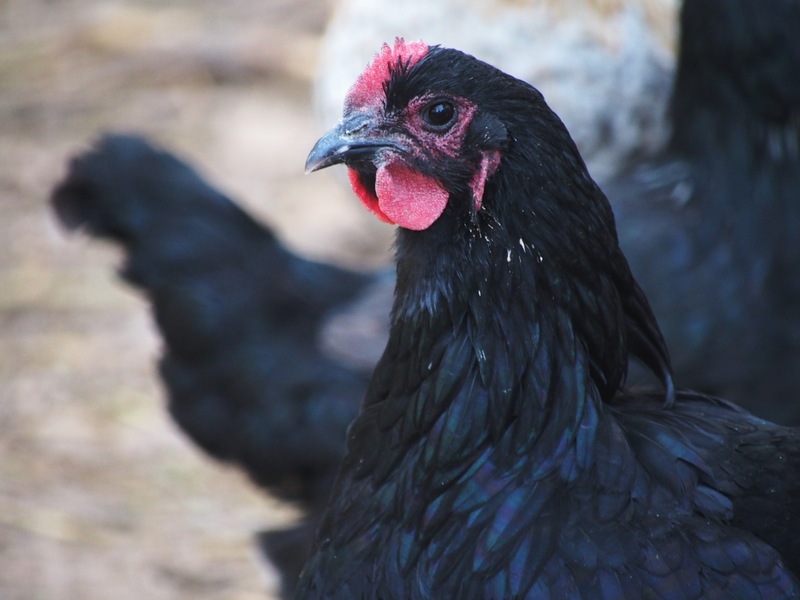 Laying hens, meat, pets? 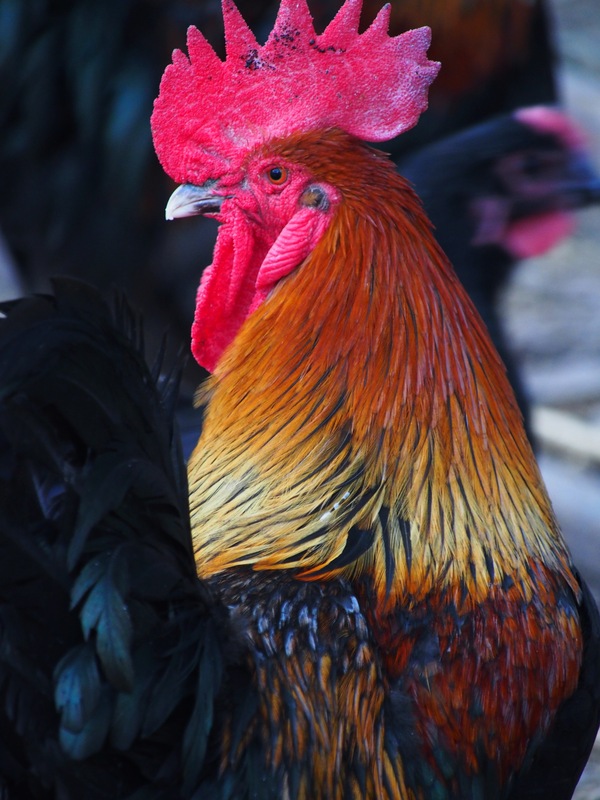 Laying hens, mostly pets – he threatens to send the roosters to the Santa Ria priests, but I think he’s too fond of his chooks. I think he inherited the farmer gene. A love of living creatures surely is a gene you all have! Those dogs crack me up. They learned how to get up there during a flash flood and now they are up there all the time. The visit was wonderful. No worries, thanks for the share! How are you doing? Not too bad thanks. And yourself? Pretty good now. Came back from the holidays with the flu – finally coming out of the fog. Sorry about the flu, glad you’re getting better now. If I’d been in your shoes, I’d have taken photos of the birds also. I would have been aiming for the eyes as well – lol. The white crowned sparrows look interesting – ours are plain of course and it was nice to see your variation. Thanks Vicki, I had never seen sparrows like that before, mine at home are so plain.